This article has been written to introduce my project about using the Universal Pattern as a training aid. You can find more information on the Universal Pattern in Infinite Insights, volume 4 chapter 8, where Mr. Parker introduces the Zone Theory and the Universal Pattern. I really believe that the Universal Pattern can be a useful training aid if broken down into smaller pieces of material students can use for practical self-defense. This is meant to give a basic understanding of the information in my project. I’ve categorized my project into three theories; 9 planes of Striking and Defending, Dimensional Sequence of Muscle Movements, and Ground Fighting Strategies (including; Joint Destruction, Close Combat Muscle Manipulation and Close Combat Muscle Destruction). In this article I will briefly discuss one of my theories under my Ground Fighting Strategies. 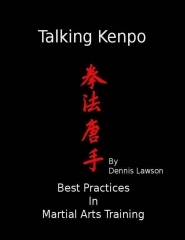 I introduced part of my strategy at the 2010 Bethany Beach USA Residential, but this project has been developing since 1999, when I was a Brown Belt and had the desire to train Principles of Motion & Principles of Self-Defense while traveling to the ground with my opponent. Over the years I’ve given my theories great thought. I would always ask my instructors “why don’t we work on …”, and say things like “we’re missing x y & z.” I’ve spoken about my theories to various martial artists; many did not understand what I was talking about. I’ve since realized the need to break my project down into several theories and into various components. Although I’ve been working on this theory through my own training for over 12 years, it has only been recently that I’ve had a small group to work on my ideas with and test some of my theories out. I’ve been able to work on pieces of my project through this group and with my students over the last 2 years. This has helped me lay out some of my ideas on paper. This process forced me to use different terminology and create some terminology to get my ideas across. By using the concepts in butchering meat I’ve created some terms to help describe how to apply these theories to the Martial Arts and how to alter them to fit the human body. I wanted to give you two of these terms (which are also tactics). The first term is CROSS CUTTING – to take the wedge of a natural weapon and track it across the large muscle groups causing the muscle to contract and tear, generally done in the X pattern. Imagine your opponent is on the ground, hugging you and pulling you to his/her body with your arms trapped. Applying the cross cut will allow you room to move and to obtain a better position. Using your opponents strength to enhance the impact of your action. The second term is CHUNKING – to grab, digging in deeply to control the belly of the muscle, than pull it away from the bone. Usually done at the points of attachment or the end of the muscle where it is attached to the bone. An example of chunking the muscle is when you are on the ground and you grab your opponent’s trapezius muscle and dig in under the muscle ripping it away from the bone. This will cause your attacker to lose control of his arm and allow you to maneuver into a better position. Chunking can be done with little effort to the small muscle groups known as the Phasic Muscles. Both of these terms can be found under my theory of close combat muscle destruction, one of my Ground Fighting Strategies. My theory is that by destroying the muscles in certain ways gives you the advantage and can possibly end the fight; even in the most disadvantaged positions. As a martial artist I have found that a lot of training is done standing up with no consideration of the ground. There are many environmental hazards to consider on the ground that may cause serious injuries or death. The reality of the situation is that sooner or later, one will have to hit the ground in combat (fighting for one’s life). For those who do train going to the ground, the focus is usually on slapping out. The ground must be our friend at all times. Without the ground we have no base to speak of. In all Arts we have basic self-defense techniques/models that we train regularly standing up. Blocking, striking, maneuvering, etc… I suggest training these models against a wall. This is a simple way to start working with the concepts I’m presenting to you. These models can be done on the ground, however; they will have to be modified. Moves will have to become more proximal. This is due to the lack of space one’s body parts can travel. The environment will not allow one to travel as far. Everything will be shorter motions and focused on short range weapons. By our paths of action we can assume that if it works standing it should work lying on the ground. But remember, we are training for survival not cage fighting. Don’t get hung up on some of the things you see in the cage. We need to remember, that an assailant in a self-defense situation, probably has friends who may join in the attack. Keep in mind that this is just an introduction to some ideas found within my project. Due to the size and complexity of this project I will be breaking this information down into several articles, videos and lessons. I’ve seen a need for more ground work basics, so I’ve developed a series of basics to add to the current ground work curriculum. I’ve compiled a list of terminology to help describe this more specifically. All of this will be published at a later date. For now I want to stick with the introduction of my project.